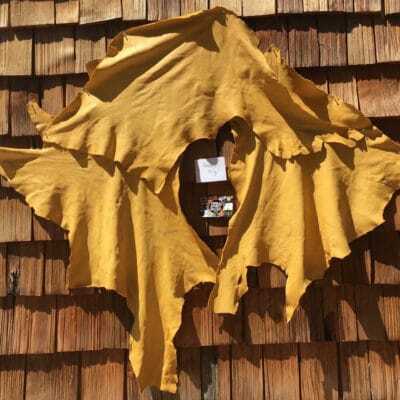 Our leather is from the Laurentian Mountains north of Montreal in Canada. Each year during hunting season we recuperate hides from hunters who are feeding their families, but don’t need the hides. 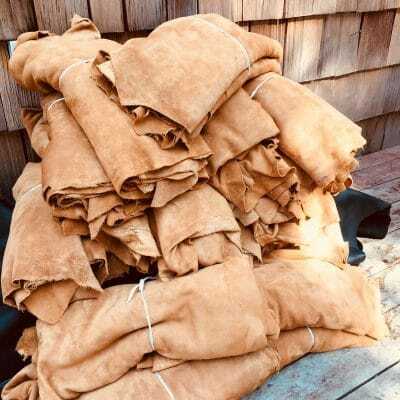 We gather them, process them and have them tanned at a local tannery (not brained tanned) It is in our Native tradition to waste as little as possible. Each White Tail Deer is approximately 10 square feet and each Moose is 8 square feet as our moose pieces are 1/4 of a moose. Hunters in our region always quarter their moose to get them out of the forest. Available from 8 sq ft up to bundles of 50 sq ft. This is wild White Tail Deer from the Laurentian Mountains north of Montreal. We gather them from hunters who are eating the meat but don’t need the hides. 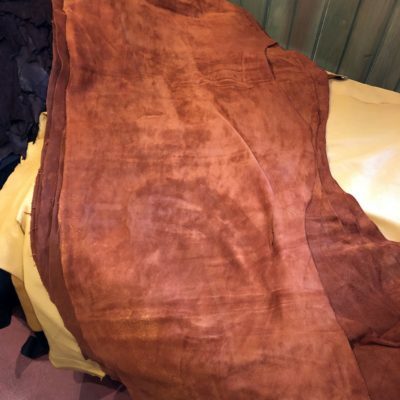 We recuperate them, and have them custom tanned at a local Canadian tannery. 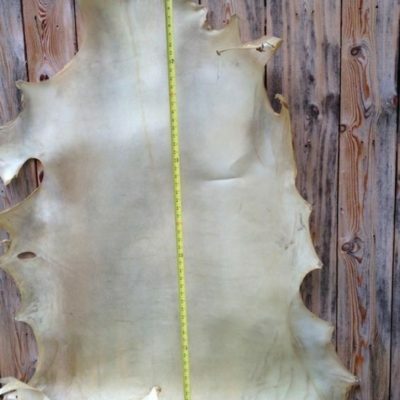 The average size of the deer runs between 6 to 9 sq ft. (the tannery measures them) 2 1/2 oz. Introducing Dark Chocolate Deer Leather. 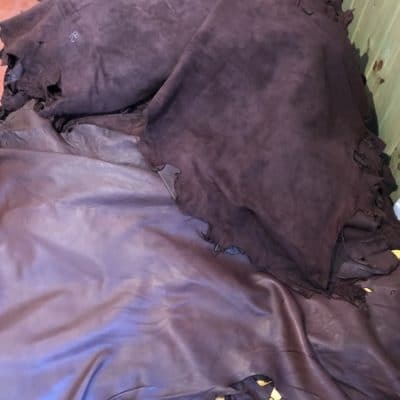 This leather is quite thin, between 1 1/2 to 2 ounce, very soft, and really rich dark brown colour. 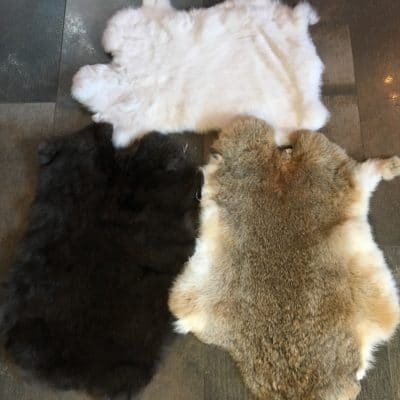 These are very fine small deer so sizes run 6 to 7 square feet each. 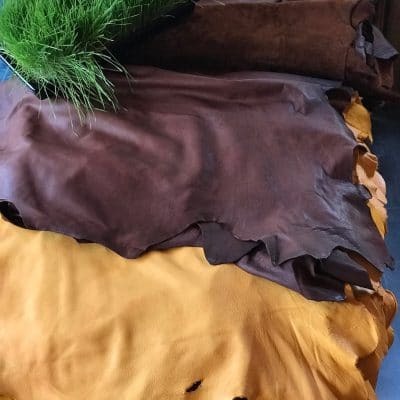 Moose Split is leather that is suede both sides, 3 ounces in thickness. 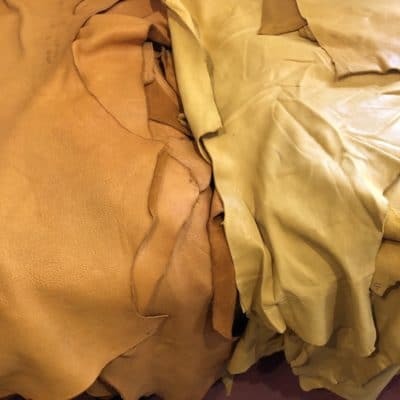 Perfect economy leather for moccasins, slippers, medicine pouches etc. 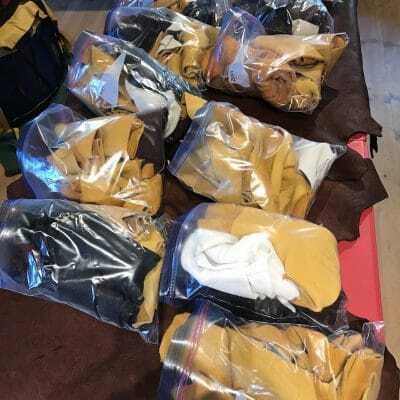 Each bundle contains approx 10 pieces of leather each between 3 to 7 sq ft adding up to at least 50 sq ft. We live north of Montreal and each year we recuperate moose hides from hunters who are feeding their families. 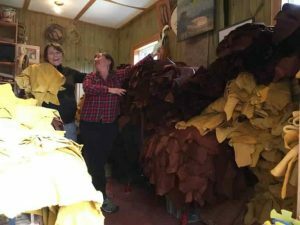 During hunting season we gather the hides and have them processed at a local tannery. (not brained tanned) Currently available in Light Tan, Medium Tan and Gold. Pieces run 5 to 8 sq ft. This is wild Moose from the Laurentian Mountains north of Montreal Canada. Our 3 1/2 Gold moose is perfect for moccasins, mukluks and mitts. Easy to sew by hand. This is wild Moose from the Laurentian Mountains north of Montreal. We gather them from hunters and have them tanned at a local tannery. 5 1/2 ounce is best for making purses, drum bags etc and for real pros moccasins. This leather is very soft and supple. This is wild Moose from the Laurentian Mountains north of Montreal. 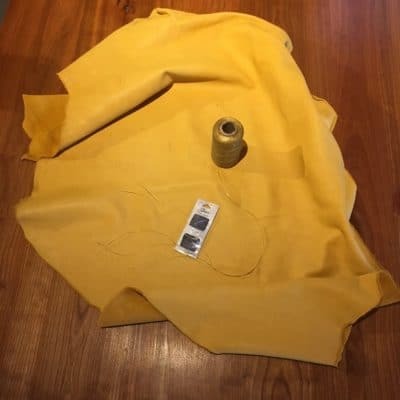 We gather them from hunters and have them commercially tanned, 5 1/2 ounces really requires a commercial sewing machine OR hole punch and lacing. 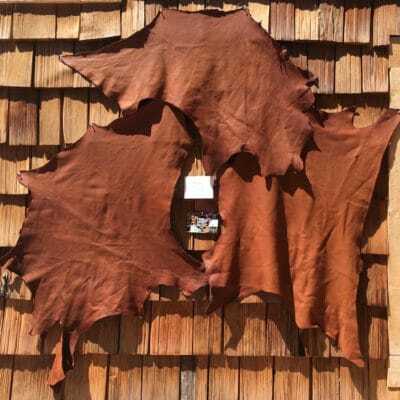 (see our leather bags for examples) Each piece is approximately 9 to 11 square feet (the tannery measures them). Please note that there may be a bullet hole although we will select the very best pieces possible. This is wild Moose from the Laurentian Mountains north of Montreal. 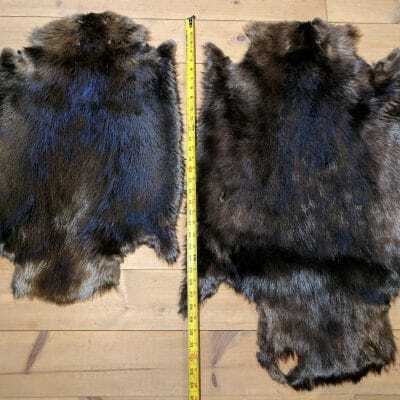 We gather them from hunters and have them tanned at a local tannery. 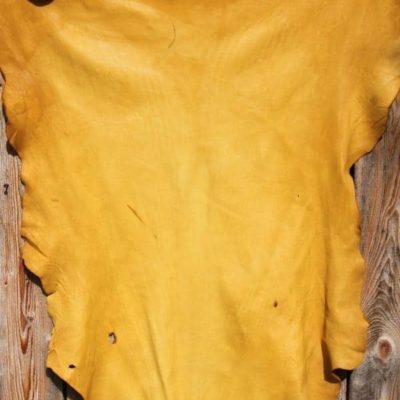 This leather is very soft and supple. 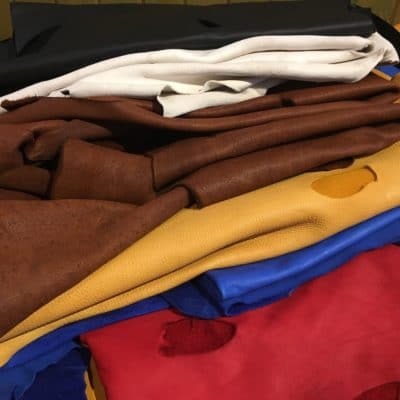 Pieces range from 8 sq ft to 20 sq ft. We are very excited to introduce our new line of coloured “deer tanned” cow leather (with more colours to come). 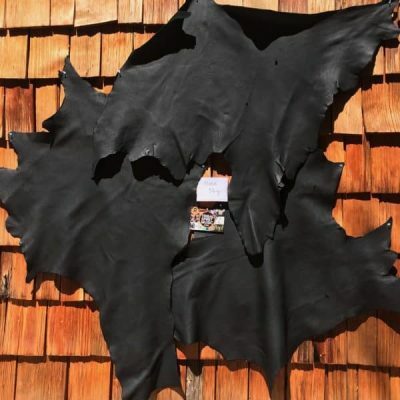 Indigenous leather is very different from the needs of the general leather industry. We like our leather very soft, supple, and with a matte finish (not too shiny). 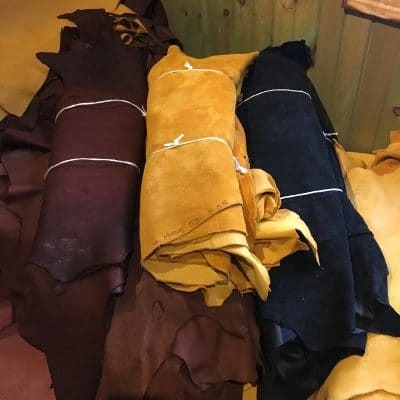 For years now we have been looking for a source of ‘native’ leather in various colours cuz some projects just demand a coloured leather….but it simply didn’t exist…SO we decided to make it ourselves. 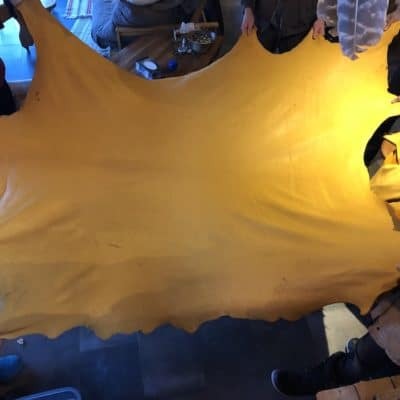 The leather is tanned EXACTLY the way deer is. The feel is same, soft and supple, same thickness and has the same matte finish that we love. Now available in purple, red, blue, green, black and gold. 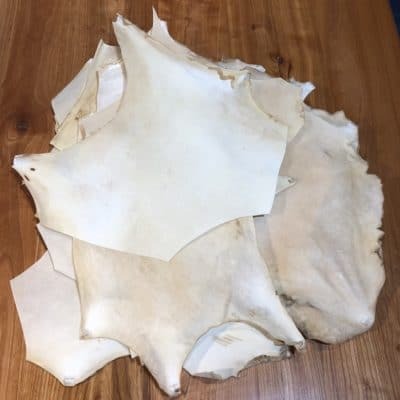 We make great drum kits which are VERY popular….and therefor create a TON of deer rawhide scraps. Perfect for car mirror mini drums, parfleche, rattles etc. We will include a baker’s dozen of scraps into a flattened box and ship it off to you!! Have Fun!! 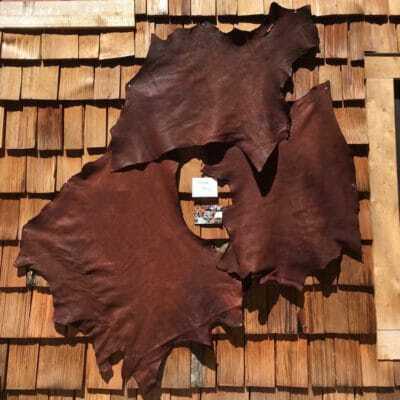 By popular demand we are adding our Moose Leather Scraps to our web site. 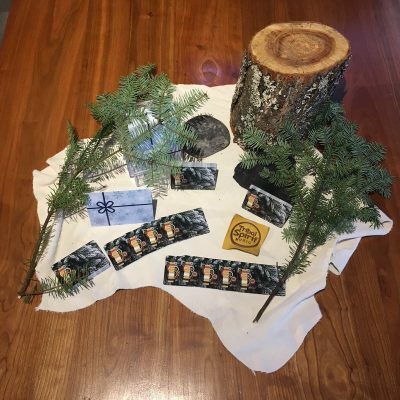 Famous across the Powwow trail (lol) when we set up people charge our booth looking for our scrap bags…and we sell out quickly….but off season what do we do with all of our scraps?…..well here they are. 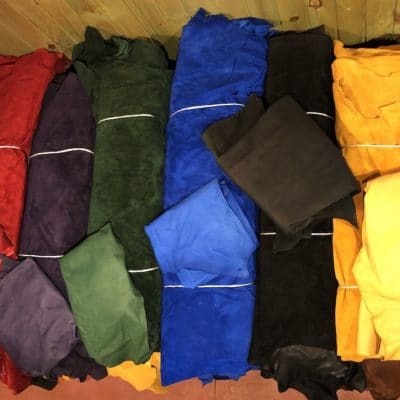 This is a well stuffed large Zip-lock bag filled with a mixture of 3 1/2 and 5 1/2 ounce moose of many colours. You can request preferences, and we will do our best. The very best way to care for your drum long term is 1) bear grease treatment twice a year AND 2) keep your drum covered in leather all the time!! 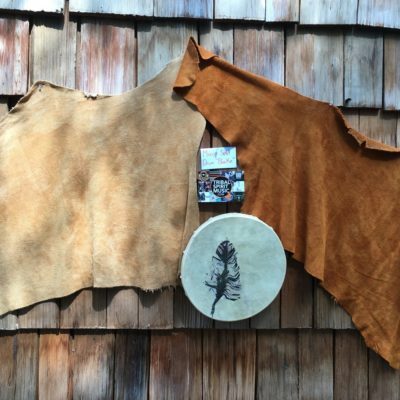 We make beautiful moose leather drum bags but they can be outside the budget sometimes. 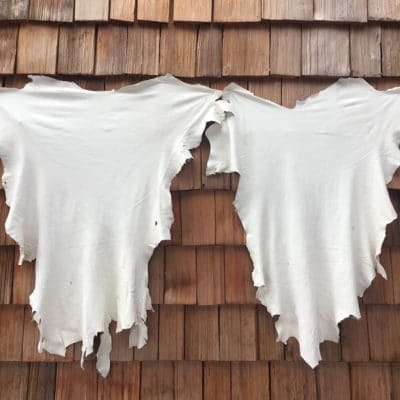 So for a budget solution our split leather is perfect. We select 6 to 7 sq ft pieces and this is plenty to wrap your drum with. It can then live inside a canvas or plastic bag…..but the leather will protect your drum. Medium (26″ – 29″) and Large (32″ – 34″) sizes available. Perfect for mitts or moccasins. Available in 3 colours: White, Brown and Natural Black (not dyed).